CLEAN TITLE on this STUNNING local trade-in. 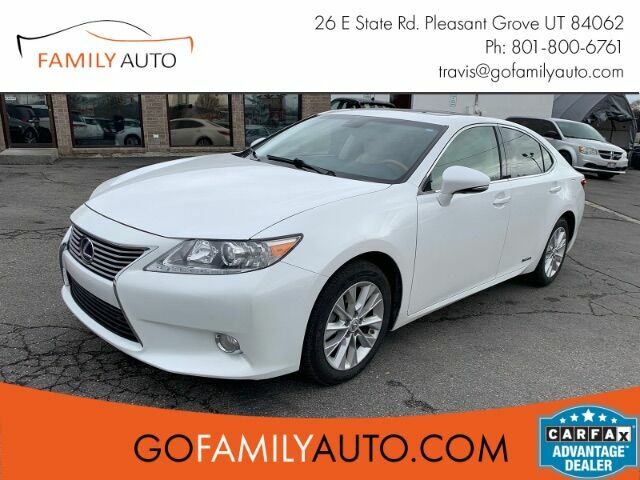 This WHITE Lexus ES 300h Hybrid is in immaculate condition and will be the most luxurious car you''ve ever owned. LOADED with Blind Spot Monitors, Leather, Sunroof, Navigation, Heated/Cooled Seats, Rain Sense Wipers, Back Up Camera, and SO MUCH MORE! This is the car you''ve been dreaming off. All inspections have been performed and this car is ready for immediate test drive/delivery. www.GoFamilyAuto.com 801-800-6761. This NON-SMOKER well maintained car is located at 26 E State Rd in Pleasant Grove, UT 84062. Financing is available with rates as low as 3.99% OAC and extended warranties are available.